NEW YORK CITY — Last week, a woman who was being beaten by her husband showed up at a city-run domestic violence center with her dog. Workers found that the dog had also been abused. It was in such bad shape that it required medical care. Both are recovering now, but officials say they are increasingly on the lookout for animal abuse cases to root out instances of domestic violence. 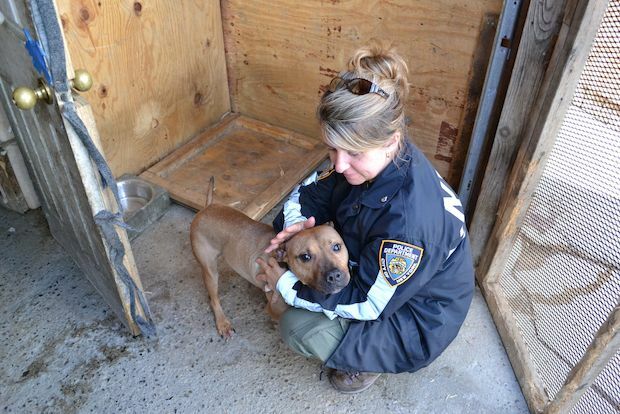 A recent study showed a link between animal abuse and domestic violence, and the connection has become a focus of the NYPD's new animal cruelty unit, which formed earlier this year. “We do see a correlation between animal cruelty and domestic violence,” said Sgt. Barbara Thomas, commanding officer of the new Animal Cruelty Investigation Squad. “Animal cruelty can be an indicator that there is something more going on in the house, such as spouse or child abuse or elder abuse." Officers in the unit and others that they're training are taught to look for signs of domestic abuse if they come across a case of animal abuse. According to statistics provided by the Mayor’s Office to Combat Domestic Violence, 71 percent of pet owners entering domestic violence shelters nationwide report that their abuser had threatened, injured or killed family pets. “About 48 percent of domestic violence victims reported that they would stay in abusive relationships because they were afraid of what would happened to their pets if they would leave their pets behind,” he said. “People love their pets — they treat them as members of their family." Fields, whose group runs the only animal-friendly shelter for victims of domestic violence in New York, cited the example of a woman who was beaten by her husband for four years. This spring, she finally decided to flee with her dog, which she was afraid to leave behind with her abusive partner. With nowhere to go, she and her Chihuahua lived in her car parked on the street, until she found out about Fields' shelter in Brooklyn. The NYPD's animal abuse squad was officially formed in July after the American Society for the Prevention of Cruelty to Animals closed its investigative unit at the beginning of the year. Since then, the number of arrests for animal cruelty increased dramatically, as did the number of animals rescued, officials said. From Jan. 1 to Aug. 28, police have received 207 animal cruelty complaints, made 90 arrests and issued 42 summonses, according to Thomas. The NYPD did not have data for the previous year, but the ASPCA said that arrests were up 160 percent. Through the end of August, the ASPCA has treated about 260 rescued animals, also a nearly 160 percent increase over the same period last year, according to statistics provided by the ASPCA, which has continued to work with the NYPD by providing assistance to animal victims, including medical treatment. The organization also still conducts forensic evaluations, police said. The Manhattan-based NYPD unit currently has three officers. While most animal abuse cases continue to be handled by local precincts, the new unit provides guidance to detective squads about laws related to animal cruelty. It also provides assistance in cases that involve a large number of animals. The squad has dealt with a variety of animal abuse cases, including neglect and hoarding, said Thomas, an avid animal lover. Before joining the NYPD in 1998, Thomas worked as a geriatric social worker and employed pet therapy to help treat Alzheimer’s patients. Thomas, the proud owner of Annie Oakley, an adopted Jack Russell terrier, said that in her spare time she continues to volunteer in a number of places, including the Hempstead Town Animal Shelter in Wantagh, Long Island. In the past, she had also worked with pit bulls rescued from football player Michael Vick’s property, she said. Sometimes, she said, animals are kept in places where they are not supposed to be living, such as an alligator found in a Brooklyn apartment, she said. A number of cases also involved dog-fighting rings, police officials said. In August, the unit rescued 20 emaciated and injured pit bulls in St. Albans and arrested two people. "It's an emotional thing to see any living being hurt in any way," said Thomas, who participated in the pit bull rescue. "But once you realize you are making such a big difference for them, it makes you that much tougher to do what you have to do."